Now Google Search Is Right In Gmail ! If you are a regular user of Gmail, then you might have faced the problem that you have leave wallpaper-search-is-now-easier-in-google/">Gmail to search Google for an answer. Then you have to select the answer, copy it and then you have to go back to Gmail to paste the answer into the now-it-is-easy-to-voice-and-video-chat-in-mac-messenger/">chat window. Now you don’t have to face the problem now with the help of Google Searchgoogle-brings-color-selector-to-search-by-color/"> Experiment in Gmail Labs. As soon as you turn on this feature from the Labs Tab under Settings, you can see amake-your-own-name-search/"> new search box on the left side of your inbox as shown in the picture. 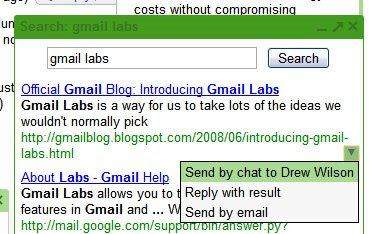 Now you can gmail-introduces-auto-complete-feature-for-labs/">click on a search result and it will open up in another window, therefore you can get enhanced-google-search-results/">what you expected.